The Figgis Agency and Archer stepped out of its routine a little bit with a two-part episode. Two-parters have traditionally been reserved for the season finale, but the setup and execution this time is worth the detour from the norm. Shapiro hired the agency to infiltrate a fancy Hollywood gala (Tinnitus awareness, naturally) to guard client Veronica Dean and the rare emerald necklace she’ll be wearing. The prospect of a fancy party excites the whole team until we find out Pam, Ray and Cyril have to dress and act like caterers, while the rest of the team gets dressed to the nines – including Krieger aka Otto von Jizzmark or Franz Turdinand depending on who you are talking to. With the team at each other’s throats, Archer’s crush on Veronica comes into play when he tries to get in close. 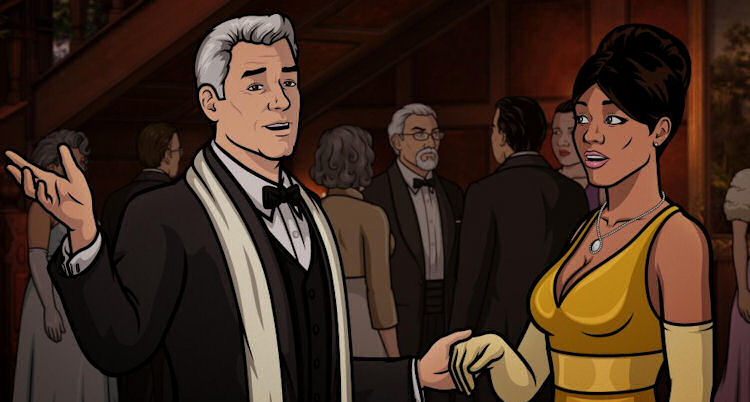 A chain of jealousy (encouraged by Pam) starts when a starlet confuses Archer for a producer and starts to flirt. Lana sees that and starts flirting with Veronica’s skeevy director ex-husband, Ellis Crane. Archer sees that so he decides to get close to Veronica to better “guard” her and make Lana jealous. Pam has the whole room on lockdown except for the location of the person they are supposed to be keeping tabs on. Lucky for everyone, Archer has Veronica in another room (and kissing) when the clown masked robbers show up. This dangerous situation gives Archer the kind of rush he got back when he was a secret agent. So much so that it all goes straight to his … pants. 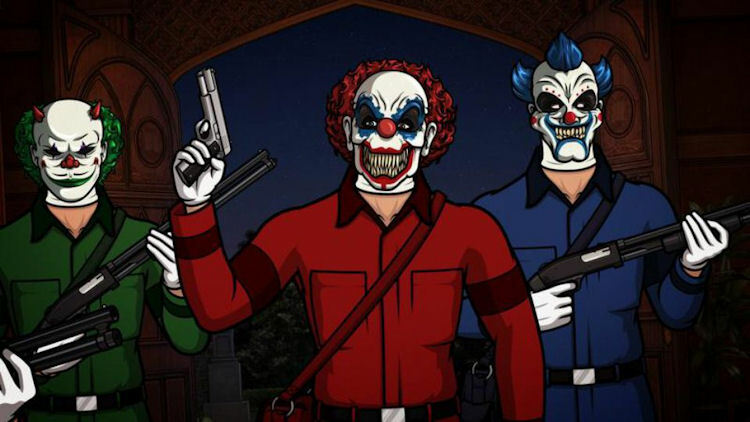 Archer takes out “Pinky Brewster,” the clown in pink and takes his place – much to the disgust of Veronica, and the setup for Part 2 begins as Shapiro comes to after getting pistol-whipped by the clown leader. A few hours have passed. The cops have arrived and the clowns have set most of the hostages go free. Also Cheryl is convinced that not only is her name now Tanya but she has Stockholm Syndrome and will one day become Mrs. Rompers the evil clown. There’s levels to Sterling going “Encyclopedia Brown” on the office’s hand towel issue. Cheryl as usual takes things a little too far, thinking she’s in Idaville for much of the episode. That starlet has an unusually firm grasp on American maritime history. “Who is she Kate Warne?” – No Cheryl, Veronica is not the first detective in America circa the 1850s. Ray has some dark theories about Casper the Friendly Ghost. Two of the clowns, Mr. Oingo and Mr. Boingo are references to film and TV composer Danny Elfman’s 80s new wave band. “In and out, in and out.” “Phrasing, you are doing great.” – With the added danger element and his arousal over Veronica, Archer’s heart is really into it this week. Previous story Are You Ready for the Summer of Civil War?